There are very few stone circles bigger than the ring of Brodgar and there are at least three others that have been claimed authoritatively, at any one time, to have the same diameter, notably two inner circles of Avebury and the circle around New Grange. These are all big names as well. The diameter of Brodgar will have been measured many times, and hardly ever do even archaeologists come up with the same numbers. Sometimes even widely different. For Brodgar there are three data of interest, 103.60m, 103.63m and 103.70m, respectively measured by Aubrey Burl, Alexander Thom (125MY) and Colin Renfrew. One cannot get higher authority on earth on this matter. Any value between 103.60 and 103.70 will therefore be regarded as valid, because, in the end, all are arbitrary. The main point is that they roughly agree. For me, as it was for Alexander Thom, the question of its scientific significance is important. I think I have found the keys to their mathematics and to how they set out their circles; and I can show it in pictograms. Nowhere else do we find stone circles as we find them on the British Isles. I think it had to do with the spread of mathematics in combination with a calendar study of the sky, which became probably something close to a religion and spread all over the Isles (Grooved ware, Recumbent circles), leaving, in all, by far the most impressive and intriguing legacy of their age. The ‘magical’ part of this celestial study would have to do with manipulating the magnetic field in the upper crust of the earth. Standing stones seem to attract iron from the surrounding field’s groundwater, this makes them into magnetic field centres, however subtle it is. It are the subtle forces that work over the longest distances and in the deepest time. Maybe these fields are so all pervading that they cannot (yet) be measured because everything is made of them, they can, maybe, only be sensed by living organisms, not by instruments. More specialised diviners could be of help here, but maybe we can find certain organisms which detect them. When, then, by cutting a circle in the most upper crust, the original natural field is altered and most probably effectively enhanced, then an atmosphere may develop which affects all of nature near that location. This could indeed render them into nurseries, physical and psychic healing centres and eventually places of pilgrimage. There is something mysterious about stone circles, which is hard to describe, but by having been put upright the stones have become part of our world, of those who go upright, they have entered the world of man, they are so to speak touched by life, by mind, but keep to their silent motionless own. By standing upright they impress, and express old age, a soul, they become one of us, and, certainly when they are bigger than us, our admiration tends to go more to the towering stones than to the people who put them there. We cannot help touching the giant stones, like we do the giant trunk of a tree, because by touching it we connect to its deep space, its age, its presence and its healing power, its wisdom. It is our bodies that still remember the subtle powers of nature, whereas we have long forgotten that dimension and lost that patience and subtlety. It will be argued here that the Ring of Brodgar and the Stones of Stenness are actually many concentric circles and that the dimensions and ratios are of fundamental importance in the mathematics and geometries stone age people used. In both cases it is assumed that the rings and circles were designed to generate earth-energetic and acoustic phenomena and that in such a way as to induce a cosmic experience in those who took part in probably chanting and drumming in the circles. This in itself could be a means to psychological and physical healing, of communal or individual (shaman) ecstasy. It is even supposed here that the one, Stenness, is a winter circle and the other, Brodgar, a summer circle, because their specific diameters correspond to the speed of sound at 20 degrees minus zero and at 25 degrees above zero, for optimal echo. Both temperatures are extreme on Orkney, but not impossible and this feature could be coincidence because the basic design of the circle dimensions is believed here to be mathematical. As often in science discoveries are made by accident, as a result of some unrelated investigation. As far as I can see now the number of stones 11 or 12 at Stenness have no direct relationship with the geometry of the concentric circles involved, and this may be the same for the Ring of Brodgar, where, I have argued elsewhere (Creation of Time), any number between 60 and 72 would be meaningful (heartbeat). If though the number of stones at Brodgar turns out to be 63 or 66 this would be a strong confirmation of the model proposed. 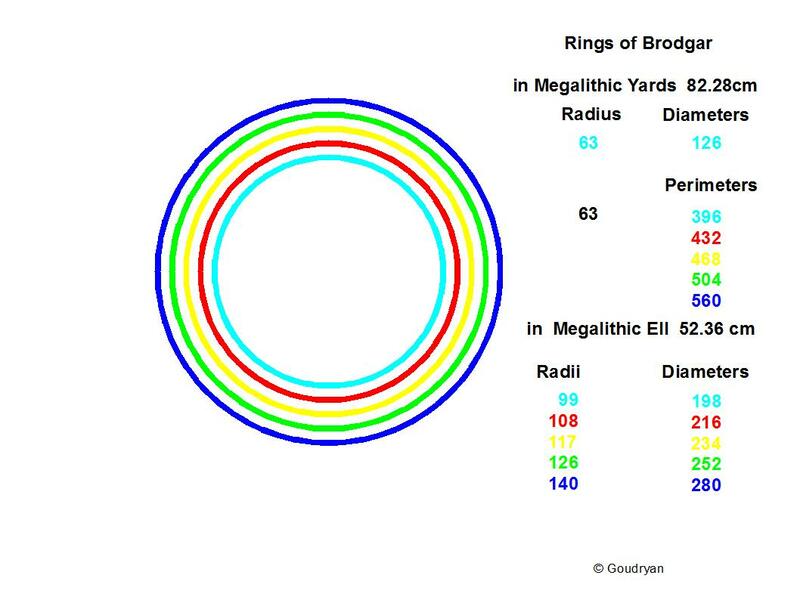 63 is Brodgars radius in Megalithic Yards, 66 would relate to its circumference of 396 Meaglithic Yards (396/6=66) and it would also directly relate and give special meaning to the 11 stones at Stenness (66/6=11). 11 in our model is the number of the mathematical circumference (22/7). The number 66 would as at Stonehenge relate to the 33 year sun-cycle, where the sun returns to exactly the same equinox sunrise point as 33 years earlier. Inner blue circle is the standing stone circle, red circle is the platform edge, yellow circle is middle of moat, green circle is outer edge moat, blue circle is outer edge of hypothetical embankment.